LeTourneau’s first rubber-tired front loader was manufactured in 1946, but that loader bears little to no resemblance to the behemoth that is the L-2350 front loader. First revealed to the world at the 2000 World Mine Expo held in Las Vegas, Nevada, this monster is the undisputed Guinness world record holder for the world’s largest earthmover. The tires are 5’ wide and 13’ tall, and the standard bucket holds the equivalent to five dump trucks. The LeTourneau L-2350 was designed to efficiently center-load haul trucks with a 320 to 400+ ton capacity. Its primary application would be (and still is) surface mining operations involving ores such as coal or copper. By being able to transfer massive loads in a single operation, processing time is significantly increased. The design process took two full years. The biggest problem faced by the engineers wasn’t the lift arms or the hydraulics, but the tires. There simply weren’t tires available on the market that were big enough to handle the loads involved. That’s why LeTourneau partnered with Firestone engineers to design a large set of tires. The first L-2350 was made at LeTourneau, Inc. out of Longview, Texas. The Generation 2 model of the LeTourneau L-2350 represents the most modern iteration of this design. The Generation 2 L-2350 has SR hybrid drive technology to reduce fuel consumption and comes in 3 lift arm configurations: standard lift, high lift, super high lift. The super high lift 33’ lift height but a reduced operating capacity. In 2011, a modified arm and bucket (70 cubic yard) for use in the coal industry was added to the design. It has been fully updated with modern safety features, too. 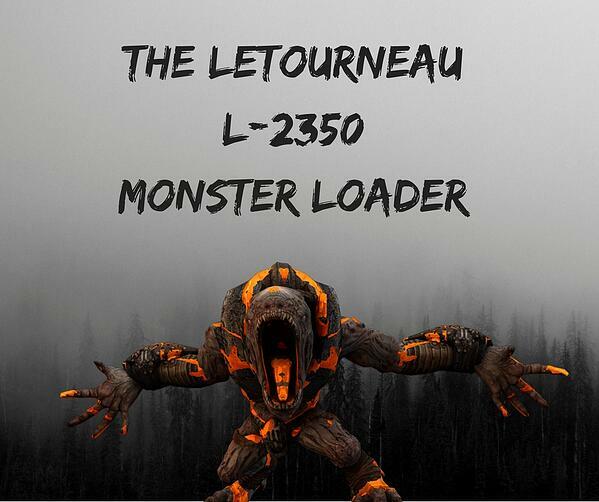 The LeTourneau L-2350 is a rubber-tired front-end loader with a standard operating capacity of 80 tons and a bucket breakout force of 263,702 lbs. It is powered by a 16-cylinder Cummins QSK 60 turbocharged and aftercooled diesel engine that provides about 2,300 hp. The fuel tank holds 1,050 gallons of diesel and consumes about 50 gallons per hour when in use. The cooling system capacity is 130 gallons, and the hydraulic tank holds 382 gallons. The propel motors on this large front-end loader are electric. The L-2350 is big in terms of height, too. The height to the top of the cab is 21.2’ and the wheelbase is 25.9’. The lift height is 24’ and the reach is 11.5’. If you want one of these monster L-2350s for yourself, be prepared to shell out at least $1.5 million. They are still being manufactured, but Joy Global acquired LeTourneau in 2011, so you’d probably find it listed as a P&H L-2350. You’d need an awfully powerful trailer to haul one of these 260,000-pound loaders, though.